The Pace Group introducing the most high tech, state of the art, modern, high rise tower in the prime location of Lahore city named Tower 27 Lahore with the slogan of providing Life above Lahore. The T27 tower will consist of luxurious apartments just like people find in Dubai or Sydney. 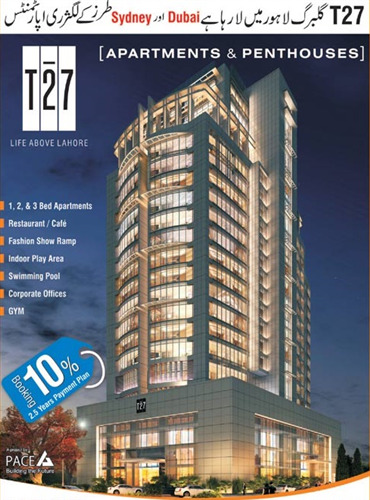 The T27 presenting lavish Apartments and Penthouses on the verge of exquisite location, in the posh area of Lahore that is Gulberg, which makes it even more lucrative, because in any new development its situated location does matter a lot to future potential inhabitants.